This is a GREAT couch and definitely worth the price. 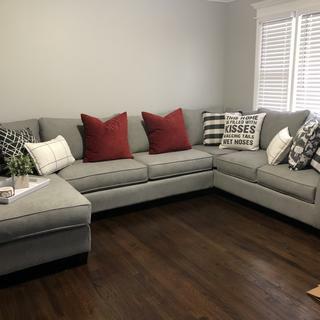 In my family, we pretty much hang out in the living room all the time, so it was SO important to me to find something that was modern and stylish but also comfortable and big enough for when we host family and friends. This ticked all the boxes and I would definitely recommend! We were looking for a large sectional that stood up against our three wild toddlers and Siberian Husky but that also looked nice. This has measured up to our needs and we are pleased with our purchase. I wanted to love this couch, but as time goes on the quality seems to be diminishing. It looked nice the day we got it, but the cushions have quickly lost their shape and after just two months our seat cushions are a wrinkles saggy mess and the couch looks like it's super old! We replaced a couch that was 10 years old and looked brand new for this one because we wanted a sectional. Not sure why the cushions look this way. It's almost as if there is too much fabric and when the foam loses its initial firmness, the fabric is saggy. I'm embarrassed when people come over and sit and stand up and the seat cushion looks the way it does. I flipped the cushions and tighten the fabric multiple times a day. This couch wasn't cheap, it's a shame the quality doesn't match the price tag. As far as looks, it's very nice. The material is even very nice. But the saggy seat cushions are something I cannot get over. 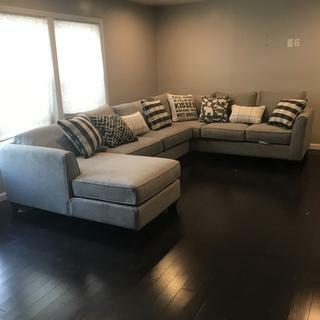 Couch color is perfect, super comfortable , well made, not a fan of the pillows but they are really good quality and the wife likes them so that’s a plus. Store reps were great, delivery guys were awesome . We absolutely love our new sectional and so do our fur babies. There’s more than enough room for everyone! And not only is it comfortable but it’s also super sturdy and supportive. Love it. The sofa is comfortable and the delivery went very smooth. I am very satisfied with my purchase. Wonderful, comfortable and attractive sectional! A great value! Love it, great price, great look, and super comfortable. Have gotten a lot of compliments already! Super happy. We went to multiple furniture stores and sat on dozens and dozens of couches. As soon as we sat on this one we knew it was the one. Firm but not too firm, big but not so big that you feel like you're a million miles away from another person sitting on the other side, the fabric feels like it could hold up to some wear and tear but doesn't have the industrial type feel that some other couch fabric seems to have. It definitely feels like the fanciest thing we bought for our new home and we couldn't be happier with it. Spacious and very comfortable couch. Have gotten many compliments on it. Fits perfectly in our den. I would definitely recommend it! Perfect size sectional for any living room. Very comfortable and spacious seating. Great price and value for a great product. This sectional is the perfect fit for our family and has become a favorite sitting area for friends as well. The seating is firm but not too hard and the throw pillows are already well loved by our two dogs. We love it! We are loving our sectional so far! So cool that it came with all these pillows! Very comfy, durable, and the perfect size for our family of five! Nice, big and comfortable sectional, my whole family love it!!! The sectional looks amazing and fits perfect in our living room. The most comfortable couch we have ever laid on! Looks great and is comfortable. Fits our whole family! Very comfortable. The cushions are stiff yet at the same time. After 1 week the cushions are broke on and we are very happy. Would by again. Super comfy! Super spacious ! Super comfy and spacious! Looks beautiful! And everybody loves them ! We added a navy blue area rug and it looks phenomenal! We love our new sectional! It's big enough for everyone to sit and still stylish enough to make our living room look classy. my favorite furniture piece ever! it is the perfect grey and the pillows are amazing. Best couch I ever purchased. It’s comfortable, affordable, and easy to change pillows with the season! Looks great in my new living room. I would highly recommend! I love it. Definitely big furniture but doesn’t feel like it’s taking up too much space. Comfortable too. The sectional arrived in excellent condition - it looks even more beautiful in my home than the show room! Love this sectional sofa! Multiple configurations to choose from and so comfortable. I love this sectional. The delivery guys were top notch. Just love my new sectional. Very comfortable and the right fit for my family room. My wife and I had a great experience purchasing furniture. Fast shipping and easy setup. Love the couch. It’s very comfortable. Already spilled something on it and it was easy to take the cover off and wash it. My only complaint is that the decorative pillows it comes with are very, very cheap. My older couch from a different store was cheaper and came with better decorative pillows (they were down feather). Other than that, we love it. It’s so cute and comfy ! Good against spills. Not for comfort. Not as soft as expected. Seems that it would hold up against spills or pets. It does have sliders on the bottom of all the legs. That was a plus that I did not know about. Overall, four out of five due to comfort. I wish we would have gotten the chaise in the left side.I didn’t realize how big it would be, and now am having a bit of difficulty arranging it in my living room. Hello Felismina! We're sorry you feel this way. If you would please send your order details, contact information and a copy of your concerns to rfcare@raymourflanigan.com we'd love to see how we can help. Is there anyway to just buy the throw pillows? BEST ANSWER: Hi Jaime, thank you for your interest in the Daine collection! For assistance with ordering throw pillows, please visit your local Raymour & Flanigan showroom. I do not think you can just buy the pillows however the entire set is wonderful. What color are the wood legs? BEST ANSWER: Hello Katherine! The Daine sectional legs have a warm dark cherry finish. The legs on my are a dark reddish brown. Looks nice and all around it’s a comfortable sectional! BEST ANSWER: Love it! Comfortable and durable. It should fit fine you just put it in a corner. What dimensions are your room? Thanks! 21 x 13 but it will be fine for you. Our tv is actually too far away. Is there something similar to this in beige or taupe? BEST ANSWER: Because we do not offer other fabric choices for the Daine collection, here are some recommendations that are sectionals but slightly different in design in the color you are requesting. All of these sectionals below offer multiple configurations and special order fabric options. If you have any questions, please contact our online sales department, 866.383.4484, option 3. We would be happy to assist you! Does it come in beige or taupe? BEST ANSWER: Unfortunately no it does not come in beige or taupe. The Daine collection is only offered in Pebble Gray, as shown.